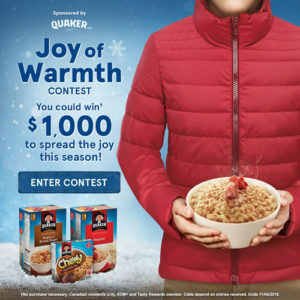 Win $1000 with the Tasty Rewards Joy of Warmth Contest! Home » Expired » Win $1000 with the Tasty Rewards Joy of Warmth Contest! Enter the Joy of Warmth CONTEST for a chance to win $1000 so you can spread the joy of the season! Give in to your holiday spirit and open up to the gift of giving. Treat yourself or your family to something nice while enjoying hot chocolates and pumpkin pies, and don’t forget to buy some canned goods to donate to your local food bank. It’s the best way to welcome the holiday season! Limit one entry per person per day.Must be a member of Tasty Rewards to enter. Limit one (1) entry per person per day.